Gillian Herring from Pali HQ makes Semi-Pro Football Team! 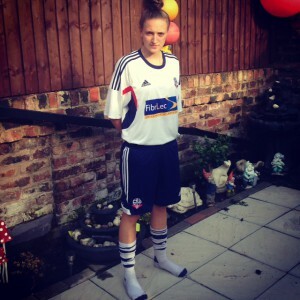 Pali HQ’s very own Gillian Herring has recently been offered a contract with Bolton Wanderers Ladies. Gillian works as a Search Agent at Pali HQ in Wallasey. Pali Ltd (Property and Land Information) was formed in 1999 to provide a one stop shop for the supply of conveyancing searches and other property related reports anywhere in England and Wales to solicitors and conveyancers at a very reasonable price. The founding directors still play a central role in the day to day management of the business and have been steadily building around them a strong team of knowledgeable, motivated and skilled individuals. Gillian joined Pali in December 2012 as a trainee Search Agent. Gillian has been playing football since the tender age of 10. She started off simply playing for school teams until the age of 12, where she entered onto her football path playing for several different clubs including Wallasey Wanderers, Delta Colts, Wallasey Athletic Ladies and Wallasey Wanderers Ladies. It was at Wallasey Wanderers Ladies where Gill was playing when she was offered a contract at Bolton Wanderers Ladies (First Team). Whilst playing at Wallasey Wanderers, Gill was given the opportunity to play at St Georges Park (The home of England) where she played a Futsal tournament and had a tour of the grounds. The Bolton Wanderers teams (First and Reserves) compete in the North West Women's Regional Football League and the Lancashire Ladies League. They currently train and play home matches at the Bolton Academy. Within the season they will travel to numerous clubs including Blackburn, Blackpool, Wigan, Preston, Chester, Burnley, Northwich, Manchester and Crewe. Well done Gill from all at Pali! Gill isn’t the only up and coming sporty star from Pali HQ! Keep your eyes peeled for more blogs on Pali’s talented employees!